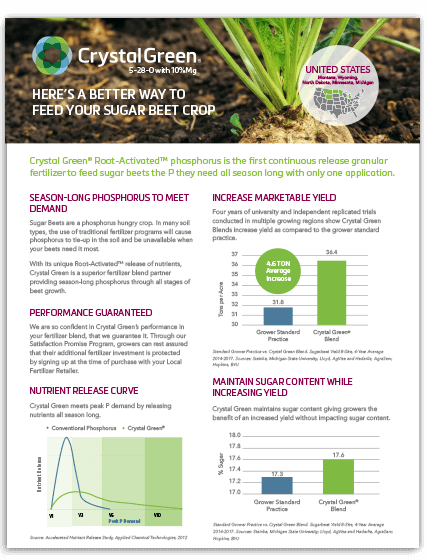 Crystal Green is the first continuous release granular fertilizer to provide Root-Activated™ phosphorus, along with nitrogen and magnesium (5-28-0 with 10%Mg), to feed sugar beet plants all season-long with one application. Unlike conventional water-soluble phosphorus fertilizers, Crystal Green granules use a citrate soluble mode of action activated by organic acid production. As the roots produce citrates, Crystal Green responds with a healthy release of phosphorus, fertilizing sugar beets on demand. As plant demand decreases, nutrient release from Crystal Green is reduced, minimizing excess phosphorus in the soil and lowering the risk of tie-up. 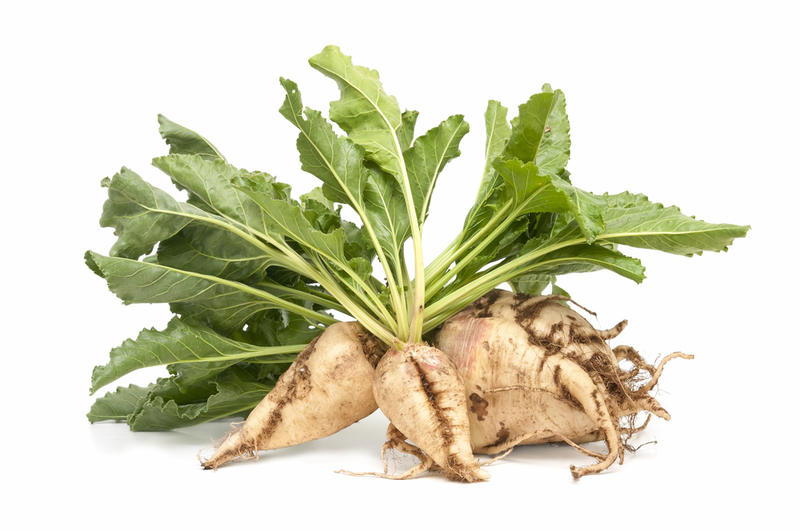 Crystal Green provides the nutrients your sugar beet plants need all season long. Crystal Green fertilizer optimizes phosphorus availability by consistently providing sugar beets with the phosphorus they need, when they need it, through its unique Root-Activated™ mode of action. All with no additional labor or worry. The release of superior phosphate nutrients promotes a healthy, dense root mass and a vibrant canopy of lush green leaves. At harvest, well-nourished plants can result in a substantially increased marketable yield in your fields. 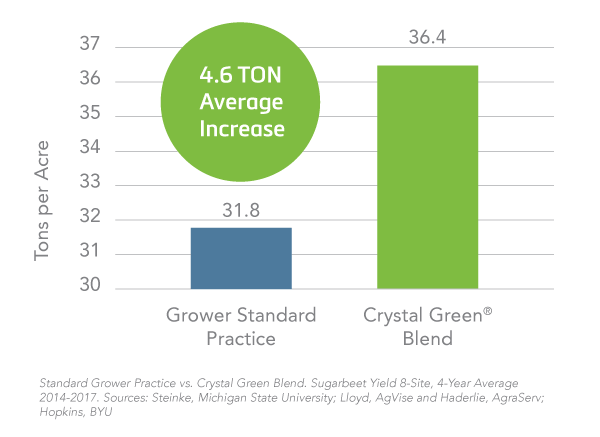 Four years of university and independent replicated trials conducted in multiple growing regions show Crystal Green Blends increase yield as compared to the grower standard practice. 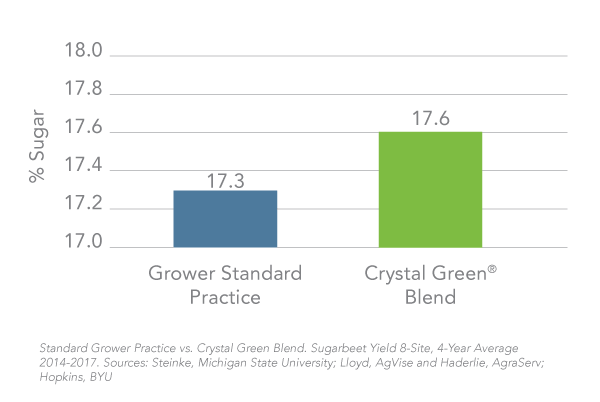 Crystal Green maintains sugar content giving growers the benefit of an increased yield without impacting sugar content.